Erawan Museum is a museum in Samut Prakan, Thailand. It is well known for its giant three-headed elephant art display. The three storeys inside the elephant contain antiquities and priceless collections of ancient religious objects belonging to Khun Lek Viriyapant who is the museum owner. The Elephant of the Universe. 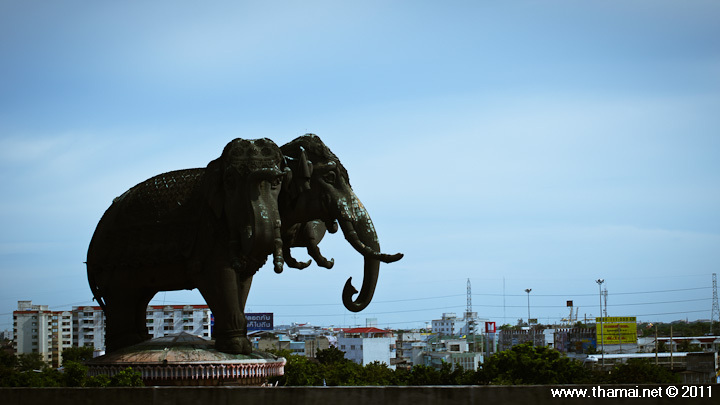 This three-headed elephant (Airavata) was born of Khun Lek Viriyapant’s ideas and imagination. It was inspired by his wish to preserve his collection of antiques as a contribution to Thai cultural heritage. Many of these were priceless objects of art; they were also held as sacred objects for people of ancient cultures. According to ancient traditions, they were believed to bring blessing and prosperity to the land and its people, and therefore must not be lost to outsiders. It had been Mr. Viriyapant’s concern to find a way that would keep these objects safe and that would also be suitable to their traditional functions. One day he had a visit from a Westerner who, during the course of the conversation, suggested the idea of constructing the most important building in the town in the form of an apple which, according to Western traditions of belief, played a crucial part in the shaping of human destiny. This suggestion was warmly welcomed by Mr. Viriyapant. He nevertheless thought it more appropriate to adhere to Eastern traditions and thus decided on the heavenly elephant Airavata of Hindu mythology. In addition, he wanted this three-headed elephant to be more than just the vehicle of the god Indra. The elephant would be a symbol of the center of the universe and, as such, the building would function symbolically as the spiritual heart of the land where sacred objects of the land were housed and revered. He then designed the building and gave the design to Khun Pagpean Viriyapant, his eldest son, to begin construction. Already during the construction, the building attracted people who came to worship. Thus it fulfilled Khun Lek Viriyapant’s wish to preserve sacred objects for the country. Although both Khun Lek and Khun Pagpean died before the construction was completed, their heirs continued their wish to create a place where ceremonies and festivales of Thai traditions might be held, and that would also serve as a museum to keep the memory of Khun Lek Viriyapant’s life and work alive for future generations. Over 10 years of perseverance, common clay and dust were finally formed into the massive 43-metre tall sculpture which today stands on a long stretch of Sukhumvit road. 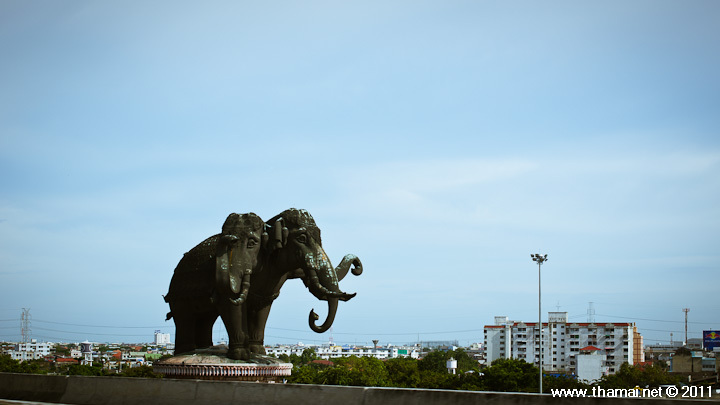 The elephant’s massive body, made of pure bronze, is set on the top of a huge round base painted in pastel pink. Inside the breathtaking museum hall invaluable reminders of Thailand’s ancient heritage are kept, while its captivating interior is lavishly adorned with elegant decorative pieces of contemporary art. The museum’s three separate floors symbolise the universe and are designed in accordance with the three-tiered cosmology of the Hindu-Thai Buddhist concept of Tribhumi. The basement level represents the underworld. Alongside rare artefacts from furniture to ceramics and pottery, large display boards detail the history and construction of the Erawan Museum. Moving up to the next level, depicting the human world, the exquisite interior decoration inside the dome-shaped architecture reflects a harmonious blend of Eastern and Western art. Highlights include the splendid stained glass ceiling on which a world map and zodiac are illustrated, the creative design of German artist Jacob Schwarzkopf. Intricately detailed stucco works by Phetchaburi artisans were elaborately installed over the sweeping staircases, and magnificent arches as well as the Avalokiteshavara shrine are situated on the mezzanine level. All these decorative stuccos are enhanced with countless pieces of crusted Bencharong ceramics. The finely embellished venue is supported by four embossed tin pillars on which are depicted religious tales. These standing columns portray the four Buddhist principles of virtue that help bring authentic peace to the heart of mankind and sustain the world. A narrow spiral staircase passing through the right hind leg of the elephant leads to Tavatimsa Heaven, deep inside the elephant’s belly. This eye-catching room on the top of the museum marks the second heaven where Indra resides, and houses two superb Buddha images, glistening with gold. Portions of relics of the Lord Buddha are placed inside the walking Buddha statue below a replica of the Phra Phuttha Sihing. Apart from a display of old Buddha images from different periods, the most charming feature of this level is its curved wall and ceiling, which was transformed into a representation of the eternal cosmos with beautiful hand-painted patterns. As a result of the solid Hindu influence in Thai Buddhism, the grand Erawan statue has come to serve as a prominent sacred object among Thai worshippers who continue to visit the museum to pay homage and seek blessings from their “God elephant”. Mr Lek Viriyahbhun’s ambitious effort has shown the incredible power of faith to make the impossible happen. This is clearly evident in this artistic masterpiece which – a new symbol of old Siam. For more information you can visit the official website in here. This entry was posted in Bangkok, Maps, Photos and tagged bangkok, Buddha, elephant, Erawan Museum, Khun Lek Viriyapant, Museum, พิพิธภัณฑ์ช้างเอราวัณ. Bookmark the permalink. Which part of Thailand affected by flooding ?